First Class Meal distribution illustration. Image by Lanxi Zhang. Skid Row in downtown Los Angeles (DTLA) is the epicenter of the nation’s largest semipermanent homeless population, and—predictably—a startlingly high rate of food insecurity. The neighborhood is also home to many restaurants and businesses that haul away tons of food waste. According to San Bernardino County Sun, L.A. County generates 4,000 to 6,000 tons of food waste every day (most of it ending up in landfills), and in the U.S., 66 billion pounds of food is discarded every year. Worldwide, an estimated one-third of food produced for humans is lost or wasted. For the many social-service nonprofits in the DTLA area, the issue isn’t attaining the amount of food needed; it’s the capacity to store and transport perishable items. Fortunately, a team of urban design and public health students from Washington University in St. Louis envisioned a possible solution. They posited that there was an existing infrastructure in Skid Row—and in every corner of the nation—that could be adapted to this task: The United States Postal Service (USPS). First Class Meal design proposal, including a new food wall combined with existing PO boxes. Courtesy Lanxi Zhang. The USPS has four shuttered post office buildings in Los Angeles—50,000 square feet of potential storage—and a fleet of postal trucks and delivery networks that “touch every household, every day,” says Anu Samarajiva, a Masters of Architecture and Urban Design student at Washington University. The plan (drafted with Autodesk AutoCAD) won the Urban SOS: Fair Share international student ideas competition—hosted by AECOM and the Van Alen Institute in collaboration with 100 Resilient Cities—which challenged student teams to apply sharing economy principles to urban issues. Announced in January, the prize netted Samarajiva’s team $7,500, with an additional $25,000 in in-kind support from AECOM to develop the plan. 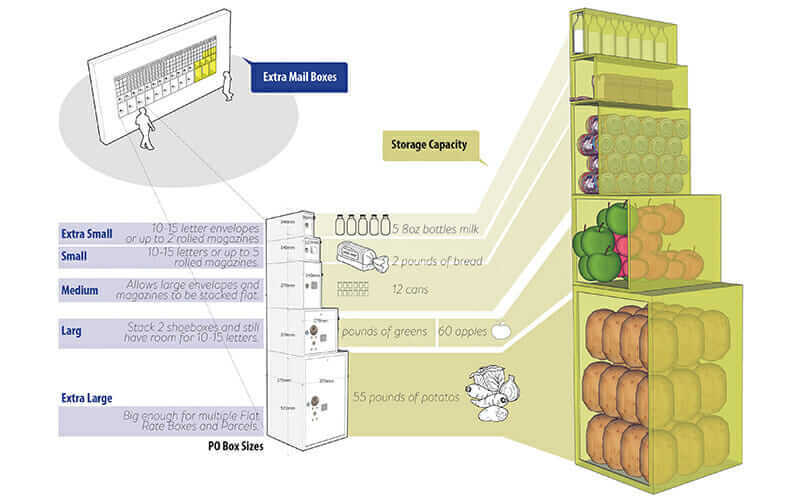 Diagram of PO box food-storage capacities from the First Class Meal plan. Courtesy Lanxi Zhang. Back in 2011, the USPS announced plans to shutter 4,000 post offices, and has reduced hours at 13,000 locations. The agency continues to struggle with decreased demand, high debt, and a lack of Congressional consensus on how to reform it. But hunger is a problem that’s not going away. There are 1.4 million food-insecure people in Los Angeles County alone. Within that figure, 23 percent of the county’s kids are food insecure. So how can the sharing-economy paradigm serve the broader population more equitably, and better connect people to necessary services? Just like with the mail, First Class Meal envisions the USPS as handling food pickup and drop-off via USPS carrier routes, as well as using food-hub storage at post offices. 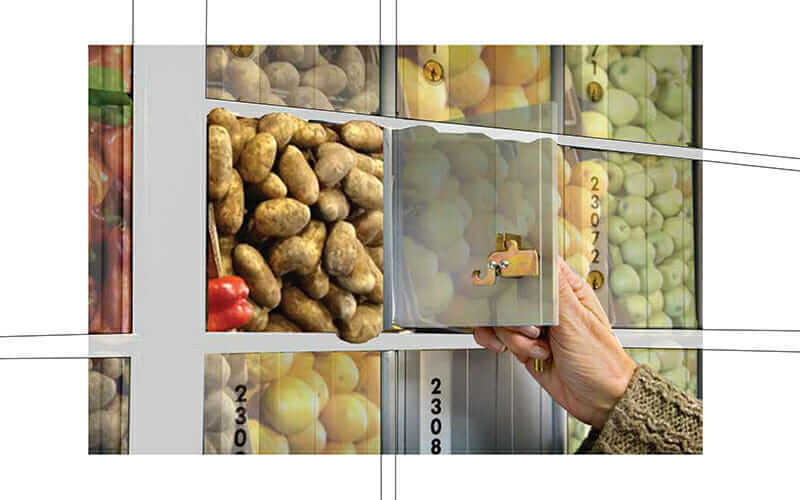 (Food storage trivia of the day: Samarajiva’s team estimates that an extra-large size PO Box can hold 55 pounds of potatoes). This partnership could prove mutually beneficial, reinvigorating the post office with a more diverse business model and a stronger role in the community. 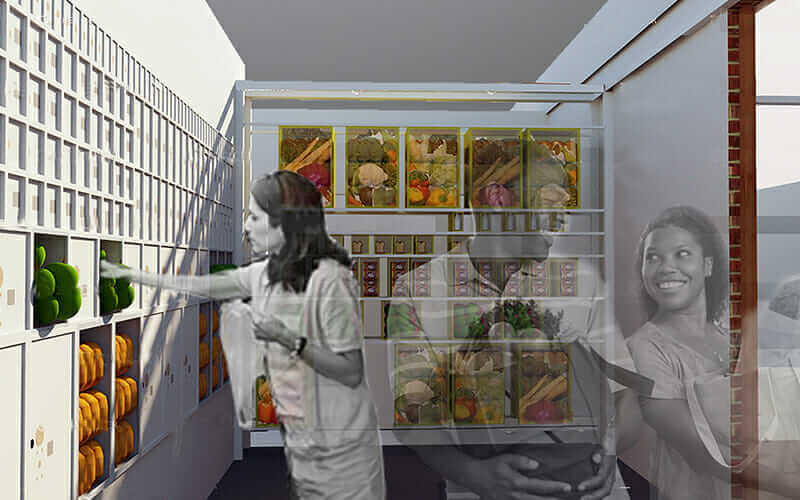 Image composite of what the First Class Meal PO box food-storage system might look like. Courtesy Lanxi Zhang. 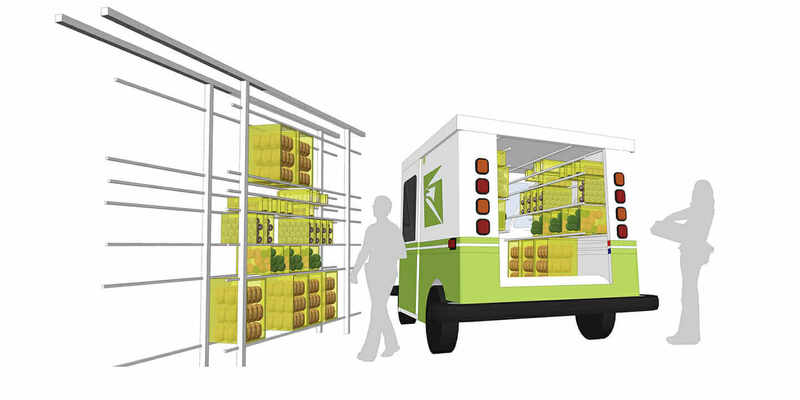 Instead of first bringing food to a central sorting and storage facility, First Class Meal suggests a hyperlocal neighborhood-based network that partners with area food pantries and social-service nonprofits to keep everything within a tight radius, distributing the collected food as soon as possible. At stake is an exponential increase in food storage capacity. The Los Angeles Regional Food Bank, for example, is one of the city’s foremost institutions in the fight against hunger and has 6,000 square feet of refrigerated storage space. But adding just a fraction of the USPS’s unused space would increase the reach of such programs exponentially. “You don’t have to turn over every single post office to this end, but you could vastly improve the distribution of perishable food with a little bit of space,” Samarajiva says. First and foremost, First Class Meal is another incarnation of perhaps the biggest sea change in infrastructure planning for a generation: Transit networks, roads, and parks can no longer be used for a single purpose. They have to be multifunctional: from linear parks that also work as bike commuter trails, to elevated subway stations that act as public plazas, or streetscapes that filter and absorb surface-water runoff. 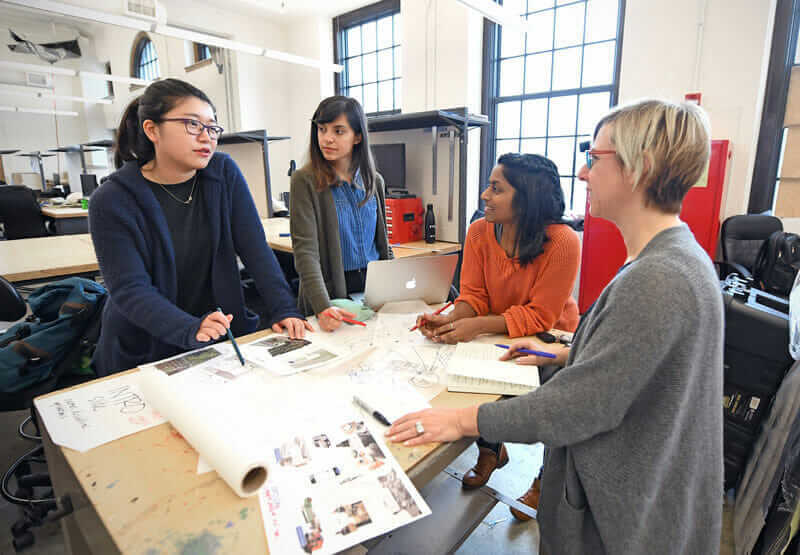 Lanxi Zhang (far left), Irum Javed, and Anu Samarajiva with assistant professor Linda Samuels in the Sam Fox School’s Givens Hall. Courtesy James Byard/Washington University. One way to ensure infrastructure is no longer monofunctional, says Engblom, is to conceive it in a more interdisciplinary way from the outset. “The challenge for our cities in the last 100 years has been that the engineers went into one corner, the economists went into another corner, and the architects went into a third corner, and there wasn’t a lot of dialogue between them,” he says. Fixing this problem is his “meta-thesis” behind Urban SOS. As to AECOM’s other charge—finding ways to expand the sharing economy’s reach beyond hailing an Uber to the latest small-plates restaurant—Samarajiva is optimistic. Despite a lack of precedent, she says the companies managing peer-to-peer sharing economy networks are intensely reactive to swings in public opinion because they depend on maintaining a wide customer base. “It’s easy to delete an app off your phone and make a public proclamation that you’re not going to use their services anymore,” she says. That’s a lesson Uber learned after the company ended surge pricing at JFK Airport during a taxi strike—one that was caused by President Trump’s ban on refugees from several majority-Muslim countries, and which many interpreted as trying to break the strike. Two-hundred thousand customers deleted their accounts, prompting the company set up a $3 million legal defense fund for Uber drivers affected by the ban.